SF Studios is a Swedish film production company, distributor (both Swedish and international) and movie theatre chain, currently owned by the Bonnier Group. 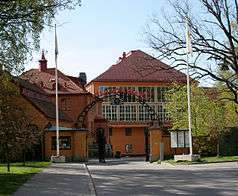 It was established on 27 December 1919 as Aktiebolaget Svensk Filmindustri or Svensk Filmindustri (SF). It produced most of the films made by Ingmar Bergman, as well as a long list of films by other Swedish filmmakers. The majority of film adaptations of the works by children's author Astrid Lindgren have been produced by SF. SF also distributes foreign films in the Nordic countries and has deals with New Line Cinema, Summit Entertainment, Spyglass Entertainment and Revolution Studios in the United States. 1984 it was bought from Bonnier Group. ↑ "Om SF" (in Swedish). AB Svensk Filmindustri. Archived from the original on 2 January 2012. Retrieved 2 January 2012.